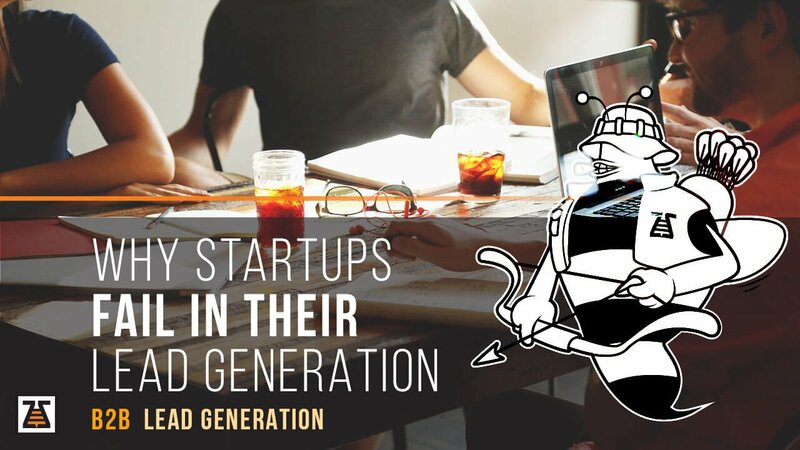 Are you failing in converting leads for your startup? As an entrepreneur, knowing how to do b2b lead generation and convert the leads into clients is critical. It doesn’t matter if you have an optimized website, or if you’re getting subscribers to your e-mail list. What matters is, are you selling your product or service or not. Social media metrics are all sweet and appealing but in entrepreneurship, it all comes down to sales. Sales are crucial not just for the growth of a business, but for its actual existence. From your website optimization to your research and sales process, it is highly possible that you’re doing some lead generation mistakes that keep you from increasing those sales numbers. You may not be aware that you’re continuously sabotaging your sales process. And before you know it, your competition already got way ahead of you. Your leads are less and the competition acquired your potential leads as their clients. That’s how the B2B game rolls today. As a startup, you just have to acquire new leads every day and grow your business on monthly basis. When you capture a lead, it is essential that you start qualifying it by utilizing some simple info. For example, is the lead somehow interested for a specific product or a service that you offer on your website? Or have these potential clients of your heard about your product or service as a consequence of a conversation with an expert from your industry? Do they need or want more information about your product/service? You should have a really straightforward lead qualifying process in hand. According to a not so recent, but still highly relevant article on the Marketing Sherpa blog, approximately 30 percent of the leads that you send to your sales team will be qualified. This is directly correlated to the next b2b lead generation mistake. You should be aware of at least the top 20 terms of your industry and your products and services. You must know how these terms function between each other, and how are you planning to use them when qualifying your leads. We can assure you that your potential clients will not be happy when they hear or read something that they don’t understand. The details for your industry and for your products must be comprehensible to the consumers. This will be of major advantage when qualifying leads. Having a simple and tendentiously rational will keep your marketing process in place and will be a perfect infrastructure for your lead qualification process. In order to have a successful b2b lead generation process, the entire enterprise should be on the same page. This means that everyone that is on board should be aware of the lead qualification process. You can’t count results by web metrics only. The sales team has to do some categorization too. Like we said above, you have to have a clear and steady lead generation process. The entire team of a company should act like a one person. One for all, all for one. This matters for the lead generation process too. Everyone has to be aware of what a potential client looks like, and everyone has to know how to attract the client. You might say “Oh, but I target everyone in my industry.” Yes, we know but do you think that every consumer in your industry has a thing for your product or service? In b2b sphere? It is vital to start targeting the decision makers to have a successful b2b lead generation process. And for your consumers, you need to work on your customer persona. Then, what you need to do is making a list, and finding the right approach so you can connect with the decision makers and your target clients. By targeting the right people, you will get valuable leads as a result. This is so much more beneficial to your business than just blind net tossing in the B2B Lake. In conclusion, b2b lead generation is a complex but, it is a very often a fruitful process for startups and SME. That is if done right and avoiding the major mistakes that a lot of the companies still do. Nobody said that lead generation is going to be easy. Whoever said that probably is a charlatan. Follow up immediately on the things that we said above in this blog post so you can avoid b2b lead generation pitfalls and maximize conversion in the process. We find highly targeted company leads with contact information of the decision maker within the company. Here is our 6-step approach to B2B Lead Generation. As a startup, you need to think long-term and acquire customers that will prove profitable over a lifetime. You need to position your business in the most profitable space on the market and create a huge demand for your product. Alone you’ll spend a huge amount of time on research, lead generation, digital marketing, testing and content creation to reach the right leads. You got to ask yourself if you’re experienced enough to do it in your startup phase. If your answer is “No” then you should consider BizzBee experts to do it for you. Leave the work to professionals while you focus on your product. We can find you highly targeted company leads with contact information of the decision maker within the company. You only need to tell us who are your ideal clients and we will find them for you. You can then focus on engaging with them.